The first 12 months of a dogs life are hugely important. If you want to get things right start with a Puppy Training Course to build a solid foundation for your pups future. New puppy? These classes will put you and your pup on the same page. You’ll learn how to use positive reinforcement training to teach your dog how you want him to behave, and gentle but effective ways to discipline when he doesn’t. You’ll also learn how to avoid future behavior problems. And you’ll both have plenty of fun in the process! Topics include: Basic manners, solving problems like jumping and chewing, and how to teach your dog sit, down, stay, come, and polite leadwalking. The dates below are the week 1 dates, the class then continues for 6 weeks at the same time/day each week. For more information on dates and times please call us on 01482 823555, option 1! Please call 01482 823555 to book or book online by clicking here. Involves a range of basic obedience exercises and assessments to assess the social ability and soundness of temperament of your puppy. You can complete the Puppy Foundation alongside your Puppy Training course with us. 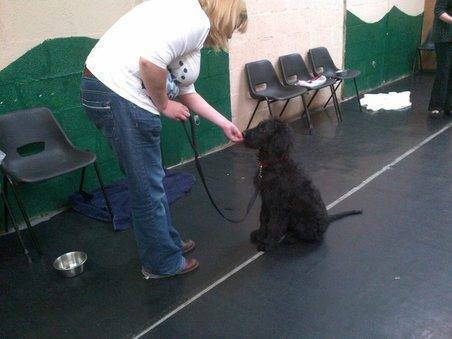 Upgrade to complete this award during your basic puppy training for only £7.50 per puppy. Train at Home via our online video course - £29.99, click here for more information. or transferable in all circumstances. Cancellations over 14 days prior to the class start date are subject to a £5 administration fee. Upon booking the course, please make sure you are able to commit to the full duration of the course. For full terms and conditions, please click here.